1- Last Thursday, our laptop which accompanied us for years was broken, and its broken hard-drive contains the data and material gathered by us for years, along with yet-to-be-published books, unfinished books, screenplays, material for our YouTube videos of our show "Quranic Moments", even passwords of our website, emails, and our accounts on YouTube and on the Modern Discussion website www.ahewar.org, and our son, Amir, who specializes in the internet and computer science, has promised to restore the lost data, but he is too busy now, and we know this, and this restoration will take lots of time. Our eldest son, Mohamed, lent us his laptop, but this is not enough, though he, along with our sons Amir and Sameh, filled it with what we can work with temporarily until the data is restored from the broken hard-drive. This is the reason for our absence from our website for the last week; we felt we could not work and we should make good use of the time, since this is an obligatory period away from our Quranism website. 2- Last Friday, we went to the Social Security to ask about the retirement money we deserve, since we are about to turn 70 years old next March, but after a long, tedious waiting, we have received the same answer; i.e., since we have worked only for 3.5 years inside the USA, we do not have the right to receive any retirement money. We payed taxes for 2017, but we have to pay taxes this year also to be qualified for retirement. This pension is not important in itself (about 400 US$ per month) since our sons pay for our expenses since we stopped working, but the importance is derived from the fact that the Social Security will cover the expenses of our medical insurance. We have not made a medical exam or checkup for 7 years; we still suffer pains of arthritis in our knees and back, and we cannot sleep while lying in bed; we have to sleep while sitting and leaning on our arms. We have suffered intense pains in our shoulders and right arm – as usual – and we refused to follow our sons' advice to see any doctors. No ointments were of any use to give us some relief, until a friend suggested some pills to relieve the muscle pains; this torment ended temporarily, but we felt depressed as our laptop fell to pieces and we were forced to get this cursed vacation and this obligatory absence from our Quranism website. 3- Another adversity has befallen us when amidst this scorching heat wave, the air-conditioner in our house was broken down; we enlisted the services of a known company; its expert received 700 US$ before he fixed the air-conditioner; he advised us to renovate the air-conditioner in our house because it has never been changed since its installation about 50 years ago; this will cost 10.000 US$ and we cannot afford this; this surprise was untimely; our house in Virginia suffers from old-age like ourselves; our house is about to crumple, we are told. 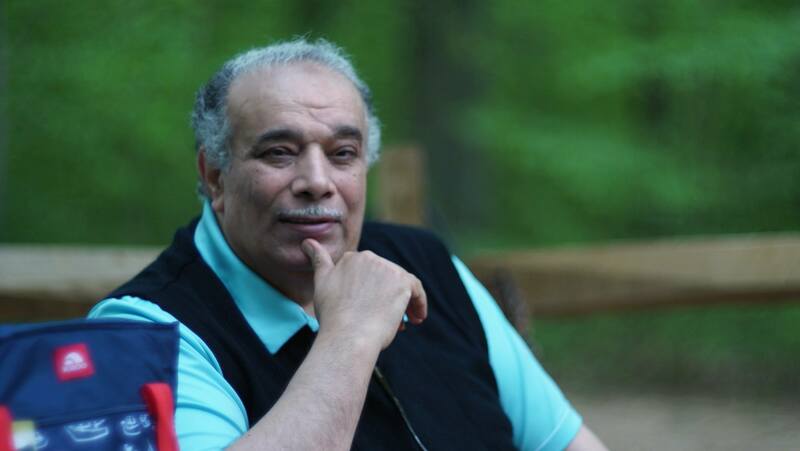 4- Our only brother in Egypt is Dr. Sayed Rifaat; the last time we saw him was 20 years ago; he is in his death-bed since a week; he is alone, away from our native village, accompanied only by his wife, as his sons are living outside Egypt and cannot return to it. we call him daily and we advise him to adhere to patience and to good faith; he is dying and he know this; he suffers severe pains because of his ailment; we implore God to receive his soul within mercy as soon as possible to be spared such pains and also so that we get relieved from our anxiety and our worrying about him. We felt depressed more than ever. 5- Our depression increased when our hopes were raised as someone promised to fund us; yet, our hopes were dashed – typically – as this funding suggestion was withdrawn, and we have been notified of this fact by the phone. This type of disappointment has occurred many times since our launching the Quranism website in 2006. 6- Last Saturday, we went to visit our dear friend the lawyer, Irving Spitzberg and his wife Dr. Virginia, who are the best people we get acquainted with inside the USA; we have not seen them for years; they were both surprised to see us walking very slowly while leaning on our eldest son; when they knew about our suffering arthritis, Dr. Virginia who suffered before from it gave us some useful recommendations, and she told us to see a doctor as soon as possible to avoid the possibility that our case might get worse. We felt sad as we cannot afford seeing a doctor and we could not tell anyone about this. How, when, and where could we see a doctor? Would our poor state of physical health deteriorate more than this?! 7- To remove ourselves away from depression, we began writing with a pen and a stack of white paper; our brain cells had this screenplay for a movie; we finished it in 9 hours, and our wife and our son, Mohamed, are witnesses to this experience. Our wife was the first to read the screenplay (or scenario); she was shocked by its frankness. The movie is titled (Feces), and it revolves around a Marxist, cultured medical doctor who lived in the 1960s in Egypt during the reign of president Gamal Abdel-Nasser who typically incarcerated communists and Marxists and all men and women who belonged to the Left. This medical doctor escaped being imprisoned by working in a healthcare unit under construction in a very remote village to get away from the spies of the Egyptian State Security Apparatus; he never realized they are watching him all the time. This doctor undertook the mission of controlling illnesses like Bilharzia, Ascaris, andAncylostoma, and he suffered from the ignorance of the villagers; he knew about their suffering torture in the police station; he began to raise their awareness, but he ended up being tortured to death. Our wife suggested that we should change the title and suggested some useful changes to be made in the screenplay; the typical argument ensued: what is the use of writing so many movies and TV series since they will never be produced at all? This led to the pivotal question: what is the use of our articles, fatwas, books, and YouTube videos?! No change to the better has ever occurred in Egypt and elsewhere; nothing will change and no reform will be introduced. Is this true or not?! 8- Within our own chat with ourselves within deep thought, we felt relieved when we remembered the idea of the glass of water. Whenever adversity befalls us, we remember the philosophy of the glass of water; i.e., one must look at the filled half of this glass and NOT the empty half; believers must be always thankful to the Lord God within patience and piety; it is OK, of course, to dream and implore God to make our wishes come true since we seek our aim relentlessly. No one's glass is empty always or filled to the brim all the time. We are not to be deceived by the glamor, pomp, and processions of the affluent, famous persons; many wealthy people commit suicide after suffering depression; millions of the impoverished ones live in peace of mind and are envied by billionaires. 1- As for our poor state of physical health, we are better than billions of people around the globe. Our late younger brother, Dr. M. Alaa-Eddine Mansour, died from cancer in his liver years ago; the same ailment is making our younger brother Dr. Sayed Rifaat, lie in bed dying now. We, ourselves, never suffered high cholesterol, diabetes, or cancer. Our arthritis is caused by years of sedentary lifestyle of ceaseless writing and reading for the last 30 years of our life; this resulted in arthritis and our being overweight. We have no time nor energy to walk on a daily basis after finishing our intellectual daily work. 2- Financially, we are better off in companion to our life in Cairo, Egypt, where we had to spend on our six sons; they are the ones now who spend on their father and his house, since they are successful in their excellent jobs here in the USA – yet, we implore God to make someone fund our IQC and our website to support our intellectual, peaceful reform endeavors. The Almighty Lord God never burdens any soul beyond its capacity; we write and make videos and we contact all those who can help us financially or within the media and the circles of policy-makers – but we receive no response. Eventually, nothing will be ever received by us unless the Dominant God ordains it first; He knows that we serve His Great Religion of Islam. As per the verses 65:2-3, God sides always with the pious, patient ones and provides for them from where they never expected; Hewill make a way out for them. God will accomplish His purpose. God has set a measure to all things. 3- Are there any hopes for introducing Quranist reform and political reform in Egypt and the Arab world? Of course there are greatest hopes. Let us remind readers of these undeniable facts. 3/1: Thinkers who are ahead of their era are wronged by their contemporaries and are victimized by them, especially a thinker like ourselves who lived in an Arab country where political, social, and religious corruption are rife along with lack of moralistic values. A thinker in elevated, refined societies is appreciated even if he/she has authored few books; on the contrary, we have authored thousands of articles and fatwas and tens of books and we have hundreds of YouTube videos and Arabs and Egyptians are cursing us and accuse us of being a 'traitor' and an 'infidel' who betrayed Islam and Egypt. Our own problem is that we face our foes with bare arms an modest means within our impecuniousness; those foes are those clergymen who ally themselves to tyrants; they own billions of US$ and the media; we own nothing but our website and our reasoning mind; they lack logic, proofs, knowledge, and brains to support their wicked, violent Wahabi-Sunnite religion of Satan. Yet, they use their wealth and influence to impose media blackout on our person so as to remain marginalized; they stop anyone who is willing to help our IQC and our person. They realize unawares the Quranic miraculous prediction about those in all eras who repel people away from God's Path; i.e., the Quran, and seek to misguide people into crooked ways and paths of polytheism. 3/2: Yet, despite our being marginalized and impecunious and our modest means, our website and our Quranist thought raised the level of religious thought within an unprecedented way – never experienced in Muslim thought for the last 14 centuries. We have smashed the mythology of gods, deities, and saints and their fake 'holy' books. Many mines have exploded beneath our feet within our career; we have paved the way for younger researchers and reformers; some of them quote our views and ideas and research results without ascribing them to our person; we never feel angry; we feel very happy as our ideas of reform are being spread within the cyberspace; we seek only to gratify and please our Lord God Who will reward our person in the Hereafter. 3/3: What is really painful to us are tens of screenplays of movies and TV series never produced at all. At one time in Cairo, Egypt, we made the acquaintance of the young moviemaker and producer Kareem Diaa Eddine, who is a well-off producer and director who received his education abroad from an American university; he bought one of our screenplays in his company (Elixir), and he owns the famous film studios in Cairo, Studio Misr, the first and most ancient and glorious film studio in the Middle East. When his first movie failed miserably and he lost a great deal of money; he decided not to direct and produce the movie he bought from us. We actually signed a contract selling this script to Kareem Diaa Eddine, and we have received a down payment, while the rest of the money were received by us within two installments. He still keeps this scenario/screenplay which is never produced. At one time, we have contact our friend, the famous Egyptian screenwriter Waheed Hamid, to seek his help to sell one of our TV series screenplays to the Egyptian TV production sector. Our eldest son, Muhammad Mansour, helped us in preparing a long many-season TV series that tackle highly entertaining tales from Muslim history, and the series was titled "Anecdotes of Ibn Eyas". Ibn Eyas was one of the most famous Middle-Ages Egyptian historians, and he used to hold meetings with his friends to narrate historical accounts to one another. We have written this screenplay in a way so that the anecdotes would tackle many eras in history of ten centuries from the era of Muhammad to the era of Ibn Eyas. After writing ten episodes of this TV series, using the name of our son as a pseudonym: Muhammad Ahmed, Waheed Hamid helped us to present the written episodes to the production sector in the Egyptian TV. The State TV Governmental Censorship endorsed the episodes and given its consent and approval, while enclosing a note asking for slight modifications and requesting to read the rest of the episodes once finished. Yet, once they knew the real author of the TV series screenplay, the project came to a halt, and officials prevented us from ever entering the State TV Building, in Maspero Street, by the commands of the Egyptian State Security Apparatus men. Within our suffering oppression and persecution in Egypt, we kept busy writing more screenplays of movies and TV series and this consoled us and gave us hope; we wished we could have sold some of them to producers and moviemakers. We have tens of them now; we still hope that they will be produced and filmed later on after our death; our sons who will outlive us may witness the time when this wish will come true. Movies and TV series are more influential than books and articles, we think. God has given us this talent for writing screenplays for a reason; He has given us the ability to research history for a reason; He has allowed us to create or Quranism website for a reason. God will choose the right moment, after our death, when Quranism will spread as the Only True Islam. We always adhere to hope however intense our increased mental anguish and physical pains are. 4- Hence, there is no reason to continue feeling depressed; our glass of water is filled with many things; the empty half of unfulfilled wishes will hopefully come true after our death. We are waiting eagerly for our death and our meeting with the Lord God; the time of our death is drawing nearer; we thank the Lord God for His guiding our soul and for providing for us all these years; we are a successful thinker and we have emerged victorious over our foes and enemies; our sons will outlive us and see the fruits of our intellectual endeavors and our peaceful striving for reform. In our modern era, there are hollow thinkers who are like bubbles and their ideas die as soon as they die. On the contrary, our ideas of reform and our intellectual endeavors will remain on earth and will bear fruit; the memory of our thought and our name will outlive our frail body within many generations to come. 1- After this chatting with ourselves within the tumultuous sea of thoughts, we felt that our depression going away; our sense of humor is soon restored; this morning, we've said jokingly to our wife and two of our sons, Mohamed and Sameh, that they should have heard what Trump did this morning; they felt intense anticipation as they expected nothing but evil; they asked us anxiously about what the president did; we told them that people woke him up to perform the dawn prayers, but he refused to budge from his bed; we laughed and they sighed in relief and smiled. 2- After this joke, we have written this article, which you have just read, to preach our dear readers.